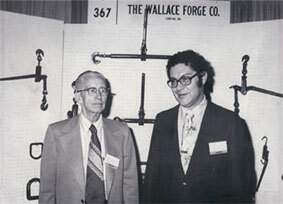 The Wallace Forge Company was founded in 1942 by Emery R. Wallace. The company started doing Die work and then progressed to doing custom forgings. It was truly a family business with Martha Wallace Doing the book keeping and Emery Wallace sinking the dies. In the 1950's Eugene Wallace, Emery's son, joined the family business after completing high school. Eugene Wallace shifted the direction from custom jobs to manufacturing its own products. In the 1970's Emery's grandson, Dean Wallace joined the company and was later joined by his own son in the 2000's. Wallace Forge Company is now a fourth generation family business and continues to develop new products in the trucking industry to satisfy our customers, and expand the industry.